PUB will be commencing work for the laying of a new water pipeline in Q2 2016. Half of the pipeline will run beneath the Rail Corridor. The works will be carried out in phases and is expected to complete by 2019. For public safety, PUB will temporarily close off the stretch of the Rail Corridor south of Holland Road during this period, and progressively reopen sections from 4Q2017 after the pipeline has been laid and the ground reinstated. The rest of the Rail Corridor will remain open to the public. PUB’s Facebook page will provide updates on the Murnane Pipeline Project. Pls click to view the project information map (updated on 7 Jun 2016). We feel that this event post at https://www.facebook.com/events/1026857430718208/ by the Ministry of Adventure is misleading, with claims about the “planned destruction” and “demise” of the rail corridor, and plans to turn it into another park connector. “It was a pleasure chatting with yet another person from the community who is passionate about the Rail Corridor. Thank you once again for allowing us to share more about this project. We have been working closely with the community on the Rail Corridor project. From our past four years of extensive public consultations on plans for the Rail Corridor, one recurring theme that surfaced was to make the Rail Corridor a more inclusive public space for Singaporeans from all walks of life, while retaining its distinctive characteristics. Far from destroying the Rail Corridor and replacing it with a Park Connector Network, our intention is to strengthen its signature “Green Corridor” experience. The Rail Corridor will be retained as a seamless 24 km-long public space that links nature and heritage. From mid-2016 to 2019, a new water pipeline will be built under the southern-half of the Rail Corridor. This will not only support our future demand for water in the city area, but secure the Rail Corridor as a contiguous space for recreational use because no developments can be built above the pipeline. During this period, parts of the Rail Corridor will be temporarily closed, but will progressively reopen after the pipeline is laid. PUB has also conducted environmental studies and will put in measures to minimise the impact of construction works. More details of the closure and reopening will be made public by PUB in due course which I could also forward you when available. Regenerating the vegetation with an appropriate natural landscape and planting strategy, and enhancing biodiversity along selected stretches of the Rail Corridor are part of our plans to strengthen the wilderness of this “nature highway”. There will also be sensitive design strategies to heighten the Rail Corridor’s sense of memory and heritage. Lastly, to allow people of all ages and abilities to access the Rail Corridor safely and enjoy what it offers, it is important that we improve the trail using suitable materials, with basic amenities added at suitable locations. These will be complementary and consistent with the character of the Rail Corridor at different stretches. As we want the Rail Corridor to be appropriate and relevant to all Singaporeans, we are continuing to collect public feedback for the awarded Concept Master Plan for the Corridor which we announced last November. Do drop by http://ura.sg/railrfp to view the proposals and give us your comments. I started the Green Corridor campaign in Nov 2010 to support the Nature Society’s proposal to keep the former KTM railway lands as a continuous green corridor. In 2011, together with various stakeholders and government agencies, I joined the Rail Corridor Partnership Group formed by URA. Over the last 4 years, there is no doubt that URA has been active in conducting many public engagement initiatives to understand the needs and wants of Singaporeans for the Rail Corridor. The feedback and suggestions from the public and community groups were then distilled into design briefs for the Concept Master Plan and Proposals, which was awarded to the winning teams on Monday. I’m very happy to join you today for the launch of this Rail Corridor exhibition. For decades, the Rail Corridor served as a transportation line to carry goods and people to and from Singapore. It was a journey of many twists and turns, as those of you who were involved in the process would know, before we finally obtained this stretch of land back in 2011. 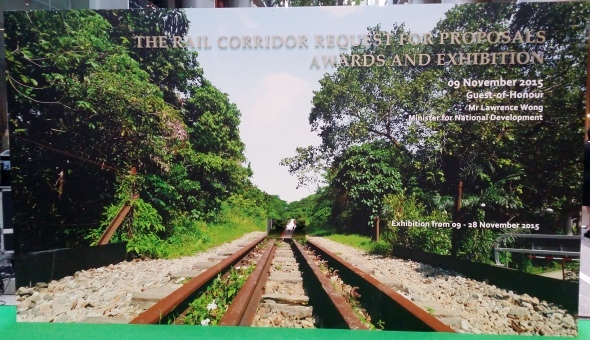 9 Nov 2015 – The Urban Redevelopment Authority (URA) announced today the Rail Corridor Request for Proposal (RFP) awards, and launched an exhibition of the awarded proposals where the public can give feedback. URA also announced the proposed conservation of the two steel truss bridges along the Rail Corridor, and acknowledged the community’s contributions in achieving a key milestone for the Rail Corridor project. Two iconic steel bridges along the Rail Corridor are up for conservation and could be gazetted by the end of the year or early next year. One bridge is located near the Rail Mall at Upper Bukit Timah Road, and the other is near the Bukit Timah Railway Station on Bukit Timah and Dunearn Road. The Urban Redevelopment Authority (URA) has proposed that the two bridges be conserved. From community farms and fishing ponds near Stagmont Ring and Pang Sua Canal, to a yoga spot and climbing wall near a Pan Island Expressway viaduct near Mayfair Park, the future Rail Corridor will offer a variety of recreation options to the estimated one million people living nearby, as well as other leisure seekers. As for a 16ha site in Choa Chu Kang that falls along the stretch of former Keretapi Tanah Melayu railway line, it will be the testbed for a future housing concept — providing 3,000 units — that is integrated with a forest-type environment. The former Tanjong Pagar Railway Station, meanwhile, will be a multi-functional community building for the next 20 years. 20 May 2015 – The Urban Redevelopment Authority (URA) announced today the five teams shortlisted to participate in the second stage of the Rail Corridor Request for Proposal (RFP). The URA also announced further details of the requirements in Stage 2, including a feasibility study and preliminary design for a four kilometre-long signature stretch to be undertaken by the successful team of the Concept Master Plan. The URA launched the ‘Rail Corridor – An Inspired and Extraordinary Community Space’ RFP on 18 March 2015, inviting design professionals to develop a Concept Master Plan and Concept Proposals for Singapore’s Rail Corridor. 18 Mar 2015 – The Urban Redevelopment Authority (URA) launched the ‘Rail Corridor – An Inspired and Extraordinary Community Space’ Request for Proposal (RFP) today, inviting design professionals to develop a Concept Master Plan and Concept Proposals for Singapore’s Rail Corridor. After three and a half years of engaging the public to gather feedback, the Urban Redevelopment Authority is ready to launch a Request for Proposal (RFP) for the Rail Corridor’s concept master plan and design concepts. Announcing this during the second day of the Ministry of National Development’s Committee of Supply debate today (March 11), MND Minister of State Desmond Lee said the RFP will firm up the overall plan and design, which will guide developments in the coming years.